Weathernews Monitors Geomagnetic Activity as Space Weather Risk Communication Service to Transportation Businesses – Weathernews Inc.
Weathernews Inc. (Head office: Chiba, Japan; CEO: Chihito Kusabiraki) has announced that they are now making satellite data on the Earth’s magnetic field available through the new Weathernews Space Vehicle Operation Center(SVOC) website as of this month. The geomagnetic data displayed on the site comes from WNISAT-1, a compact satellite designed and built by Weathernews. Disruptions in the Earth’s magnetosphere caused by solar flares interfere with communications and power systems on land and especially aboard aircraft. Data from WNISAT-1 is the first step toward developing more accurate geomagnetic storm detection and a service menu that supports flight operations in the North Pole where geomagnetic activity is concentrated. The SVOC at Weathernews Global Center in Japan handles the remote operation of WNISAT-1, and started using the compact satellite to monitor geomagnetic activity from last summer following its successful launch at the end of 2013 from Russia. Currently, Space Weather Prediction Center at the National Oceanic and Atmospheric Administration (NOAA) mainly issues warnings when a large-scale solar flare occurs. Then in order to prevent major accidents occurring when flying across the North Pole region, it becomes necessary for airlines to divert flights. 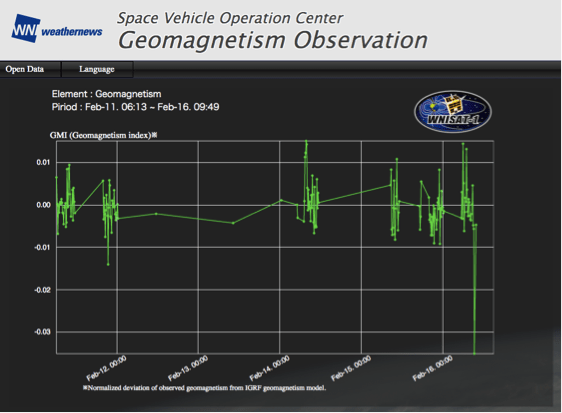 The new SVOC site displays normalized deviation data from WNISAT-1 on Weathernews’ own Geomagnetism Index (GMI). The GMI compensates for the period of the WNISAT-1’s orbit, making the data more useful at any time and any region. By monitoring the magnetic field surrounding our planet with WNISAT-1, Weathernews hopes analyze data and anticipate the degree of impact on aircraft in order to help ensure flight safety. In addition to aviation, Weathernews plans to pursue applications of WNISAT-1 that minimize the effects of communications disruptions in maritime transportation as well.